Join us as we celebrate this year’s winner of the COIN-OR Cup, the most coveted prize in computational Operations Research. This year’s celebration will take place Monday November 2nd at The Fieldhouse, 1150 Filbert St, just steps from the Marriott. The celebration begins at 8:30 pm! As is traditional, we will have a Members and Users meeting during the lunch break on Monday November 2nd, 12:30 pm — 1:30 pm, in Marriott – Franklin 9, Level 4. Anyone interested in open-source software tools, open standards, or data and model repositories for any aspect of operations research is encouraged to attend. Bring your own lunch and ideas. Visit the Computational Infrastructure for Operations Research booth (#10) to learn about high-quality, free, open-source tools for OR professionals and students, suitable for commercial, educational, and personal use. 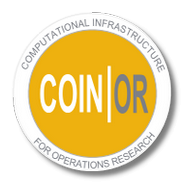 COIN-OR is the place to go when you need a ‘white box’ for algorithm research and development. We do binaries, too! We’re around the side, near the Career Centre. Already familiar with COIN-OR and looking for something to do for half an hour til the next talk? Volunteers are always welcome to “staff the booth.” The COIN-OR booth is a great place to network with other COIN-OR community members, colleagues, and random members of the public. Rehearse is an algebraic modeling library in C++, that has been added to the COIN-OR repository. It works in a very similar way to the equivalent proprietary ILOG Concert © library. Paver is a collection of Python scripts meant to simplify the task of performance data comparison and visualization. Some example usages of PAVER can be found here. This paper describes the setup, usage, and features of Paver. The JuMP Team announced the release of JuMP 0.5, an open-source algebraic modeling language in Julia, now with support for algebraic modeling of nonlinear problems using Ipopt with a familiar scalar-based syntax similar to AMPL and GAMS. JuMP can efficiently compute sparse Jacobians and Hessians for large-scale problems using reverse-mode automatic differentiation coupled with Julia’s powerful just-in-time compilation abilities to generate and compile specialized matrix generators at runtime, all in memory. For example code, see the documentation. Benoit Chachuat announced a new project in COIN-OR: MC++ provides an implementation of various methods for computing bounds for factorable functions, in the form of convex/concave relaxations, Taylor models, or spectral bounds. A main objective in developing MC++ has been to make the bounds computation as simple and natural as possible, similar to existing interval arithmetic libraries. This way, MC++ can be quite useful for the fast prototyping and testing of new algorithms and ideas in global or robust optimization. See the MC++ project page for more information. The winners of the 2013 COIN-OR Cup are Miles Lubin, Julian Hall, Cosmin Petra, and Mihai Anitescu for a parallel, distributed-memory simplex implementation for large-scale block-angular LPs, motivated by energy applications of two-stage stochastic programming. At the core of the implementation is specialized linear algebra for factorizing and solving linear systems with the simplex basis matrix at each iteration. COIN-OR libraries, in particular the CoinFactorization class of the CoinUtils package, were a foundation for their implementation. In addition to ranking highly on the stated criteria of effective use and impact, this submission stood out to the judges for its close alignment with the interests of the COIN-OR originators. The judges also were impressed that the submitters were looking so deeply into the CoinFactorization code. This is an especially difficult task given the provenance of this part of COIN.